Tiarra Del Rosario threw for 279 yards and three touchdowns to help Cimarron-Memorial’s flag football team score 32 unansweredpoints and beat host Shadow Ridge 32-20 on Friday evening. Tiarra Del Rosario threw for 279 yards and three touchdowns to help Cimarron-Memorial’s flag football team score 32 unanswered points and beat host Shadow Ridge 32-20 on Friday evening. Jordan Ford had 163 rushing yards and two touchdowns for Shadow Ridge. Sam Silva had eight catches for 137 yards and three touchdowns for Cimarron. Green Valley 14, Liberty 0 — At Liberty, Christina Mayberry rushed for a touchdown and caught a touchdown to lift the Gators past the Patriots. Tiara Jimmison had 10 tackles and four sacks for Green Valley, and teammate Hanna Serquina had two sacks. Foothill 32, Silverado 6 — At Silverado, Madysyn McArthur threw for 245 yards and four touchdowns as the Falcons routed the Skyhawks. Sydney Babakitis, Whitley Brow, Morgan Melton and Chloe Collins each caught touchdown passes for Foothill. Collins also ran for a score. Julia Lynch had 11 tackles to lead the Falcons defense. 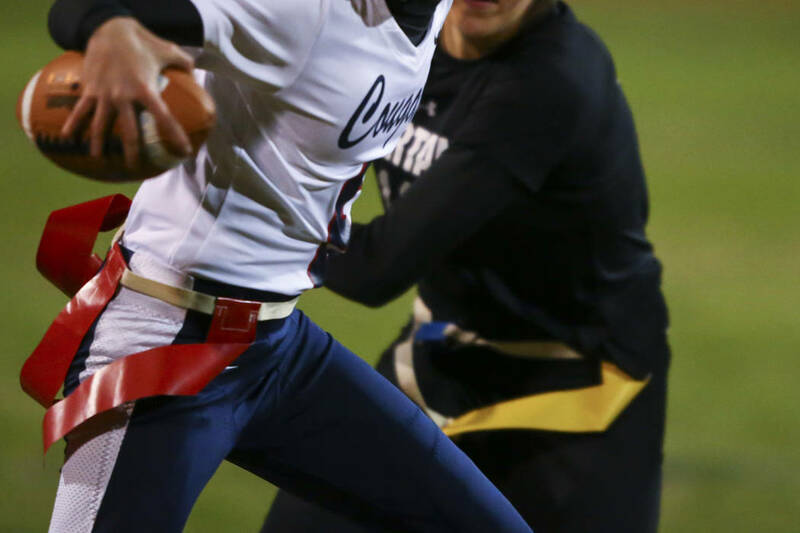 Coronado 33, Basic 12 — At Coronado, Caitlin Shannon completed 26 of 34 for 304 yards and four touchdowns and ran for a score in the Cougars’ victory over the Wolves. Coronado’s Jensen Boman caught eight passes for 122 yards and a touchdown, and teammate Reagan Raimer had two touchdown receptions. Shawna Slater led the Cougars with an interception, a sack and four tackles. Legacy 40, Centennial 7 – At Legacy, Jalyn Joule threw for 314 yards and five touchdowns and ran for another score as the Longhorns stormed past the Bulldogs. Mikaela Nunez caught three touchdown passes, while Allanah Subira and Mia Reed-Liveing each caught a touchdown pass. Vanessa Carreon-Negreros had four tackles to lead the Longhorns on defense. Mojave 13, Sunrise Mountain 12 — At Mojave, the Rattlers came from behind in the second half to topple the Miners. Mojave quarterback Sophie Barton threw a touchdown pass to Marshae Aikens-Butler, and Tiana Mikell ran for a touchdown. Kayla Wilkerson had two interceptions for the Rattlers. Cheyenne 33, Western 0 — At Cheyenne, the Desert Shields blanked the Warriors. Arbor View 6, Palo Verde 0 — At Arbor View, the Aggies beat the Panthers.